Vampires continue to fascinate us, but the legends have strayed a long way from their original meaning, argues Professor Martyn Rady. The latest commentary on ‘vampires’ In Poland and Bulgaria (summarized in The Guardian, 16 July 2013), which are respectively some decapitated skeletons and staked corpses, shows the problem with studies of vampirism today. Any undead person, or person who is thought to be still walking when they were previously buried, is considered a vampire. These creatures are not automatically, however, vampires; they are merely revenants or returners. All cultures have believed that the dead may on occasions return to life, but that is not to say the returned will share the characteristics of the vampire. The Greek revenant or vrykolakas might thus return to this world in order to help with the ploughing or other household chores. The West African demon who hides in trees ready to rip out with his long tongue the innards of the unwary traveller, may feast on the living, but he was never human and thus had never experienced mortal death. Both are, however, frequently described as vampires, along with such other supernatural manifestations as ghouls, strigoi or screech-witches, and cannibalistic shape-changers. The origins of this confusion lie with Augustus Montague Summers (1880–1948). Summers was a pretend priest, notorious exhibitionist, and associate of Aleister Crowley, which is never a good sign. He made his money writing superficially learned books on the supernatural. The Vampire: His Kith and Kin (1928) lumps together a range of revenant stories, together with examples of creatures feasting on the living, and posits a single category of malevolence, which he calls vampirism. The book was a best-seller and Summers rewrote it under several different titles. We need to pin the vampire down, or else like Summers we will render every evil object a vampire. To be a vampire requires three things: (a) revenance, to be returned from the dead, (b) a proclivity or even physical requirement to feast on the living, and (c) contagion, the ability to infect others with the disease of vampirism. These are necessary conditions. Nothing less will do. Once we have established the conditions, the provenance follows. Vampires originate in Serbia. The original name, which is upir, is Slavonic and means a demon. In Serbia, however, vulgar traditions of Orthodox Christianity established for the first time the combination of the three features that we have determined. Possibly, this had something to do with beliefs in ‘slow death’, whereby the spirit leaves the body over a period of weeks; possibly, it was related to practices of ritual exhumation; possibly, it was synthetic of Christianity and other traditions. We can, nevertheless, trace pretty clearly how the Serbian notion of the vampire passed into common, European consciousness. Between 1718 and 1739, most of modern-day Serbia was incorporated in the Habsburg Monarchy. In the late 1720s, reports began to reach the Austrian authorities of vampires in Serbia, most notably of the case of a certain mercenary soldier, Arnold Paole. He had complained of having been infected by a vampire, had himself died, was seen to have returned, was accused posthumously of a spate of murders, and was found not to be decomposed in his grave. Upon investigation, both he and some of his victims, who had died of infection as a consequence of his attack, were found when exhumed to have fresh blood in their cavities. The report on Paole’s case was sent by the local Austrian military authorities to Vienna, but was intercepted and published in news sheets. From this point on, vampirism could be found throughout the Habsburg Monarchy, with copy-cat cases and explanations for unusual deaths following in Bohemia, Moravia and Hungary. What really, however, transformed good yarns into something that had a larger resonance was the theological consequence of vampirism. The Austrian authorities, who investigated cases of vampirism in Serbia and elsewhere, were keen to put a rationalist spin on their discoveries. They tried to explain the cases they came across by reference to scientific processes of bodily decomposition and of the way rumour might be generated. The same approach had been followed by Michael Ranft in his 1728 treatise, which sought to rationalize the alleged evidence for the dead chewing their shrouds. At this time, however, there was a backlash against the Enlightenment, led by the Catholic clergy. For them, vampirism was evidence of the demonic at work; so, by the same token, it was proof of the supernatural and, by extension, of the possibility of God’s own intervention in the affairs of men. The vampire thus became drawn into the contemporary debate over the efficacy of miracles. 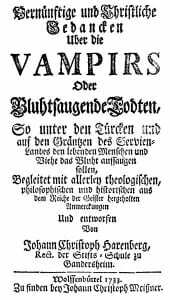 As a consequence, the story of the vampire was communicated to a much larger, opinion-forming elite, who were concerned with the Enlightenment contest with revealed religion—in particular through the pro-miracle, Auguste Calmet’s Treatise on the Apparitions of Spirits and Vampires, or Ghosts of Hungary, Moravia etc (1751 and many other editions). The subsequent tale of the vampire would need to address his ‘aristocratization’ (by Byron, Polidori, and the anonymous author of Varney the Vampire, 1845–47), his sexualization (in Sheridan Le Fanu’s lesbian thriller, Carmilla, in 1872), his location in Transylvania (by Stoker, in 1897), and his subsequent embrace by wan-faced teenagers who have difficulty getting up in the morning. Let us, however, not confuse the vampire with other revenants or even zombies. The vampire has his own characteristics, and very much his own pedigree. Martyn Rady is Professor of Central European History at University College London. He wrote this piece in the Romanian city of Cluj, the historic capital of Transylvania, where he spent the summer researching eighteenth-century judicial procedure in the local archives.